Amanda Whitaker came back to racing just 3 weeks after her horrific Mallory Park crash with 4th place at the Oulton Park Gold Cup meeting in Cheshire. Following my well publicised accident at Mallory Park I would like to firstly thank all of the Marshals and Paramedics at Mallory on Sunday. They did a great job in difficult circumstances. I'm sure I can speak on behalf of all the drivers in saying we appreciate your help this weekend and throughout our season. 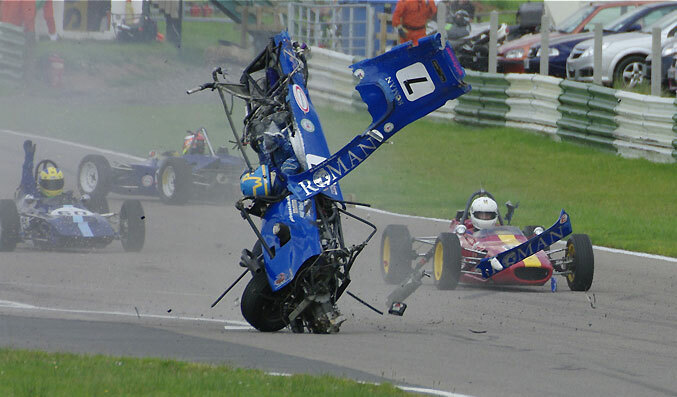 Amanda suffered a huge crash at Mallory Park this weekend in the HSCC Formula Ford Championship. Amanda showed a clean pair of heals to her rivals at her home circuit Croft this weekend in URS Classic Formula Ford 1600. Back with a win at Brands! Amanda took a comeback win at Brands Hatch in another thrilling Historic Formula Ford race on the fabulous full Grand Prix circuit. 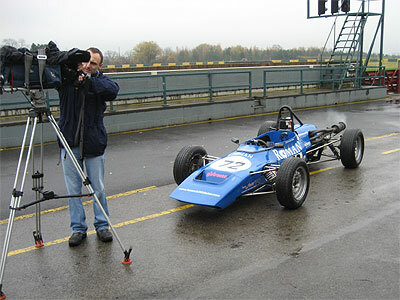 Amanda was forced to miss the round of the HSCC Formula Ford Championship at Castle Combe due to a minor operation. She is expected to make a full recovery and will be next racing at Brands Hatch on Sunday 5th July. Amanda took a 1st place and 2nd place at Snetterton this weekend in the double header HSCC Historic Formula Ford encounter. She grabbed Pole Position in qualifying by just 5 hundredths of a second from David Wild. 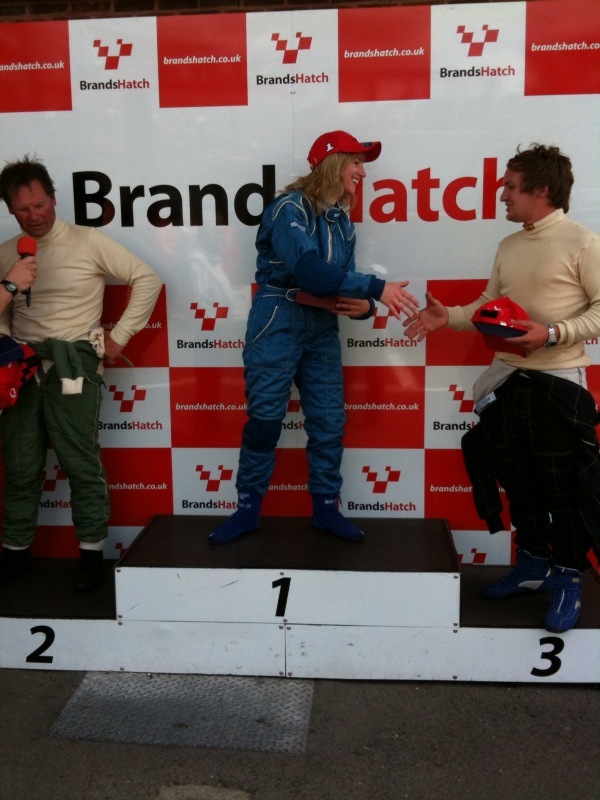 Pole and win at Oulton Park! 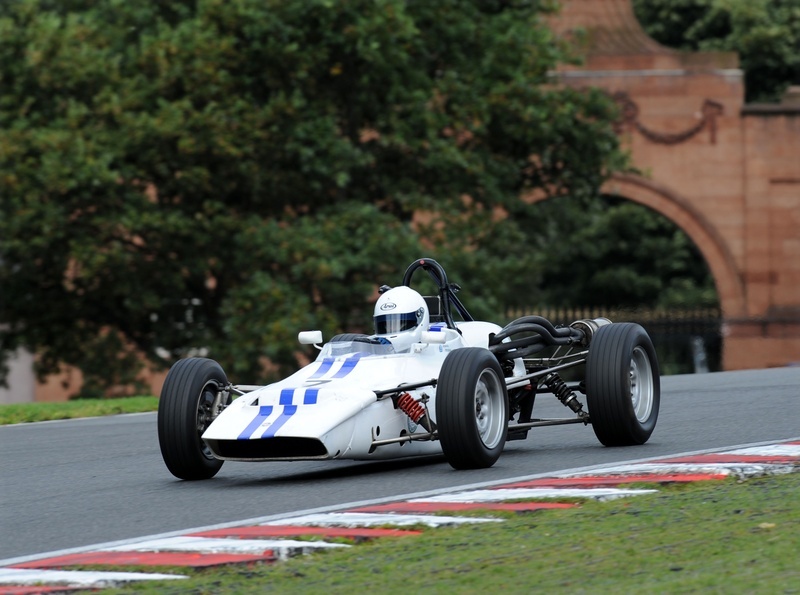 Amanda completed a perfect weekend at Oulton Park by taking a win from Pole Position in the URS Classic Formula Ford Championship. 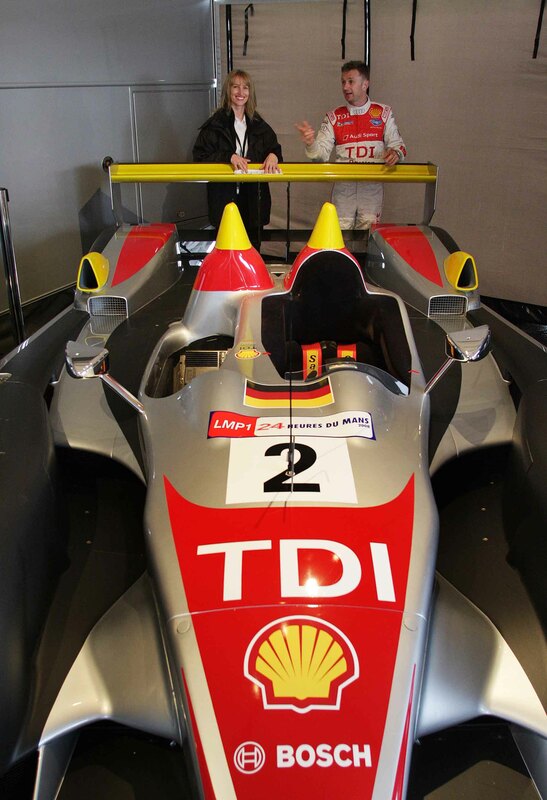 Amanda helped to launch the new Audi R8 - V10 engined supercar at Silverstone last weekend. She also met Le Mans driver Alan McNish - both used to do kart racing at the same time in the 1980's! Amanda finished 3rd at Silverstone International circuit after a race long battle with HSCC Formula Ford title rival Westie Mitchell. She qualified 2nd on the grid, alongside Callum MacLeod despite losing time in the pits due to a misfire. 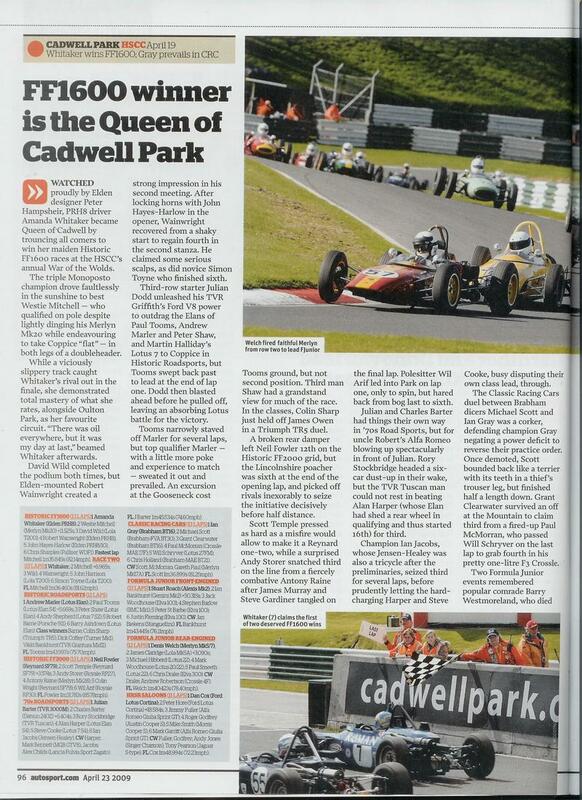 Autosport featured Amanda in a race report on 23rd April 2009 after her double win at Cadwell Park. 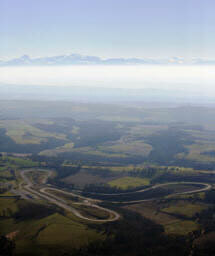 For a higher resolution version, please go to 2009 photo's in the photo gallery section above. Amanda showed her rivals a clean pair of heels this weekend at Cadwell Park taking 2 wins out of 2 races to take the lead of the HSCC Historic Formula Ford Championship by 1 point! Amanda made a good start to her 2009 racing campaign by taking 3rd place in the HSCC Historic Formula Ford season opener at Donington Park. Amanda had two test days in one week when she shook down the cars she will be racing in the 2009 season. Amanda has had a last minute call up to help launch the new BMW Mini in Pau Arnos, South of France. 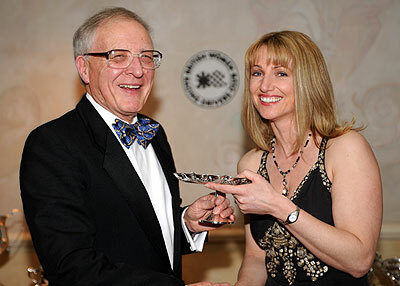 Amanda took top honours in the 2008 British Women Racing Drivers Club awards. 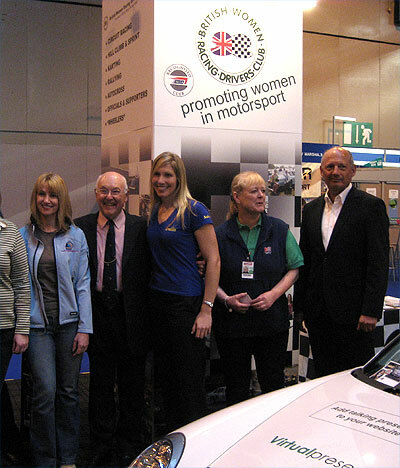 Amanda has been chosen as a nominee for the new British Women Racing Drivers Club Gold Stars. These prestigious awards are to be presented at the Autosport International Show in January where the BWRDC have secured a large stand. Amanda made an appearance on BBC Radio as a guest of Lisa McCormick to talk about racing in the household.